Content on this website is intended for general information only. For answers to your specific questions or to schedule treatment, we invite you to contact us at 301-588-5858. Your kidneys help to filter waste products from the blood. Sometimes, damage to the kidneys is discovered through a routine blood test. Acute kidney injury may occur after exposure to a toxin, during a bacterial infection, while taking certain medications, or rarely, during diagnostic imaging tests involving the use of contrast dyes. Symptoms of acute kidney injury may include dehydration, reduced urine production, nausea and vomiting, back pain, swelling of the legs, or shortness of breath. Diagnosis requires a blood test of the serum creatinine level and frequently also includes ultrasound and urine tests. After an acute kidney injury, the kidneys may heal and regain normal function over time. However, sometimes acute kidney injury leads to a chronic loss of kidney function. Patients with acute kidney injury may require hospital care and/or temporary dialysis to prevent death. These urgent life-saving measures can stabilize blood levels of electrolytes and reduce the levels of waste products in the blood during the time that the kidneys are not functioning. 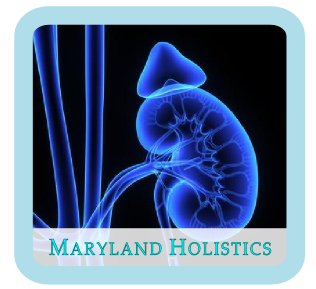 Maryland Holistics provides treatment for acute and chronic kidney inflammation (nephritis) and other types of kidney disease. We specialize in acupuncture treatment which can stimulate the body's healing system to improve the kidney's ability to function normally following a kidney injury. Our treatments can support your health in addition to the treatment and diagnostics provided by other members of your health care team. Our services are provided at outpatient clinics and can support the body's healing systems in ways that are different from dialysis or hospital care. We offer a range of natural health services and can provide these in a way that is fully integrated, designed, and fine-tuned for you to receive the maximum benefit. We can provide treatment for multiple health concerns at each appointment. If you wish to speak to the doctor prior to scheduling an appointment, please contact us for a free 5-minute phone consultation. Maryland Holistics LLC is the private practice of Eric Windsor, D.Ac., L.Ac. Maryland Holistics is a preferred provider in the Blue Cross, CareFirst, United Healthcare, OneNet, and MDIPA networks. We also accept Cigna, Aetna, and several other insurance companies as an out-of-network provider. It is our pleasure to serve you. If you wish to schedule an appointment or have questions prior to treatment, please call our office at 301-588-5858. Our professional offices are designed to be an oasis for healing. Both offices are located near available parking and public transportation, and are ADA accessible.